Our first meeting in 2012 drew 10 people. In two years, over 70,000 people had signed on to our campaign. For the students of Divest Harvard, a movement I co-founded in 2012, this is a welcome and long-awaited sign that reason and righteousness can prevail. Butterfield acknowledged what we have long fought to instill in our community: Every dollar of profit from fossil fuels is a theft of the future. This is the case even without the official sanction of university leaders who have stubbornly refused to acknowledge that fossil-fuel investment constitutes what Harvard Professor Jane Mansbridge called “an immoral bet.” Harvard President Drew Faust has stubbornly refused even to debate divestment with students and faculty, let alone exert moral leadership on this urgent subject. Such has been the state of affairs in the world’s wealthiest and most prestigious university, whose cherished motto is veritas—truth. Butterfield’s declaration brings home two critical lessons for today’s citizens and activists. First, youth are the true leaders in our age of climate justice. As Bill McKibben wrote in The Guardian upon hearing Butterfield’s announcement, “Credit a remarkable campaign. Harvard students—like those at so many other places, including Penn and Cal where campaigners are currently sitting in—waged a relentless fight, even as officials told them no over and over again.” Second, Harvard’s bottom-up path to change is one more sign that too many people at the top of our most powerful institutions have forfeited—through intransigence, inaction, self-interest, or ignorance—their right to lead. Good and reasonable people from every corner of our society are forging new paths toward the future. In the matter of climate chaos, we will no longer wait for the people at the top to approve. If you’re just learning about Divest Harvard, it’s worth noting the fierce dedication with which Harvard students sustained this “relentless” campaign to educate our campus, engage our administration, and resist the status quo. Our first meeting in 2012 drew 10 people. In two years, over 70,000 people had signed on to our campaign. Over 270 members of Harvard faculty joined the call for divestment. We were the first campus to hold a referendum on divestment: 72 percent of Harvard students called for their school to divest from the 200 largest fossil-fuel companies. We blockaded Massachusetts Hall, our president’s office building, for over 24 hours, asking for nothing more than a public dialogue on divestment. Harvard arrested a student—the first campus arrest since the Vietnam War and the first of the fossil fuel–divestment movement—rather than facilitate an open discussion. More than 180 people around the world joined us for a weeklong fast. 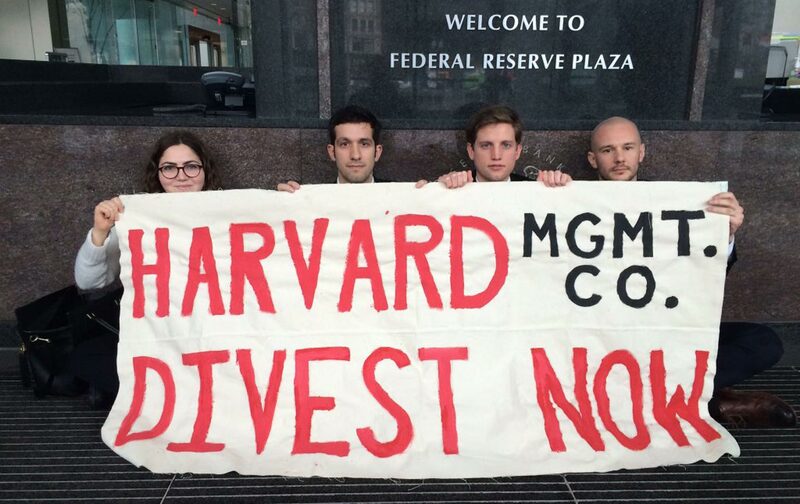 We sued Harvard University for failing to divest. Students organized a sit-in, again at the president’s office in Massachusetts Hall, but were forced to leave after 24 hours: University administrators had police block access to bathrooms. We organized Harvard Heat Week, a week-long shut-down of several central administration buildings. Hundreds of alumni came back to campus, including Bill McKibben, Darren Aronofsky, and Cornel West. The rallies that week were the largest of their kind in Harvard’s history. Four Divest Harvard members were arrested outside the Harvard Management Company’s headquarters in downtown Boston. This spring, students once again blockaded University Hall in their call for fossil fuel divestment. “Looking forward, we’re excited to work towards a policy that institutionalizes full fossil-fuel divestment,” said Divest Harvard student Naima Drecker-Waxma after Butterfield’s statement. Because as much as we celebrate Butterfield’s seeming pause from investing in fossil fuels, we must also remember that divestment has always been about more than selling stocks. With divestment, civil society stakes its moral capital on the transition to renewable energy. It slices through the fog of fossil-fuel propaganda to reveal an industry that shamelessly destroys the earth’s climate system for the sake of profit and power. Divestment aims to build a broad-based movement, because everyone, everywhere has something to divest—from personal investments to city or state pension funds. Combine the creation of a social stigma with grassroots power, and you have a movement that can catalyze new political and economic opportunities for bold climate solutions. And with this as our guide, we’ve produced results. To date, 718 institutions and over 58,000 individuals comprising $5.45 trillion in investments dollars have divested from fossil fuels. Student movements at the University of California, Stanford, Yale, London School of Economics, Oxford University, and dozens more have pushed schools to align their investments with the values of higher education. By staunchly dismissing divestment for years, Harvard President Faust and the rest of its leaders appeared both unjust and clueless. History came knocking at their door, but they were too busy rearranging the deckchairs to notice. As painful as the fight at Harvard has been, it’s prepared us for the next phase of struggle. The lack of moral leadership we experienced at Harvard is now reproduced at the national level. Trump’s election has led to a White House and federal government overrun by deniers; but instead of denying moral responsibility like Harvard, the Trump administration denies reality altogether, most recently by beginning the process of withdrawing the United States from the Paris Climate Agreement. Climate action cannot afford to wait for this White House. There’s a new wind blowing, and it comes from smart citizens working with elected officials in cities and states who are determined to strategically accelerate the energy transition and resist the most destructive ambitions of the fossil-fuel industry and the politicians who have sworn to protect it. And we’ve seen change. Last year Portland, Oregon, became the first city in the country to ban all new fossil-fuel infrastructure. The small town of South Portland, Maine, passed a landmark ordinance that single-handedly blocked the flow of tar sands across New England. Maryland’s state government banned fracking. Of course, we have all been inspired by the brilliant water protectors of Standing Rock. Two hundred thousand people marched in the streets of DC on April 29, and more than 370 satellite marches across the country joined in solidarity. Hundreds of citizens are training to run for office and reclaim all levels of government by, for, and of the people. As a graduate of the student divestment movement, my focus is on building local political power in my home state of Maine. There is a profound power-shift taking hold of our country, and it’s not just aimed at the transition from fossil fuels to renewable energy. It’s an uprising of friends, family, and neighbors who answer the call for climate justice that our failed leaders have ignored. As institutions like Harvard continue to flunk the moral tests of our age, we are finding ever-more creative and powerful ways to enact the changes that are required to avoid the worst impacts of climate change. This wave is led by young people who have been on the right side of history for years. We’re following our moral compass. We’re not waiting.